New England has several free agents to decide about and other needs to fill if it wants a Super Bowl repeat. No Days Off. No Days Off. No Days Off. Bill Belichick surprised a lot of people Tuesday at the New England Patriots’ Super Bowl victory parade in Boston when he began that chant. Was he referring to last season? Or the upcoming one? A day earlier, Belichick said the Patriots were already five weeks behind most other teams in preparing for the 2017 season. So you can be sure he and his staff are already back at it, preparing for a Super Bowl defense in Minneapolis next February. No team has repeated as Super Bowl champion since, well, the Patriots, in the 2003 and 2004 seasons. Can they do it again next year? The oddsmakers in Las Vegas think so. They’ve already installed New England as 5-1 favorites. The Patriots are well-positioned to address offseason needs. According to Spotrac, a website that tracks contracts and salary caps, the Patriots have about $63 million available in salary-cap space. That’s sixth-best in the NFL. The Patriots are the only 2016 playoff team among the 10 franchises with the most cap space. WHICH UNRESTRICTED FREE AGENTS DO THE PATRIOTS BRING BACK? New England has 14 unrestricted free agents. 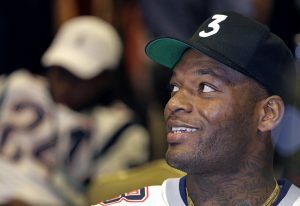 Among them are five Super Bowl starters – tight end Martellus Bennett, defensive tackle Alan Branch, linebacker Dont’a Hightower, and defensive backs Logan Ryan and Duron Harmon – as well as leading rusher LeGarrette Blount, defensive end Jabaal Sheard, fullback James Develin, defensive end Chris Long and late-season acquisition Michael Floyd, a wide receiver. Others include injured offensive tackle Sebastian Vollmer (injured all last year), linebacker Barkevious Mingo, running back Brandon Bolden and tight end Greg Scruggs (on injured reserve). Hightower has to be the priority. He’s the best run-stopping linebacker on this team and a big-time performer. In the Super Bowl two years ago, he was the one who came out of nowhere to tackle Marshawn Lynch a yard short of the end zone, setting up Malcolm Butler’s game-saving interception one play later. On Sunday, his strip sack of Matt Ryan in the fourth quarter was the game-changer, giving the Patriots life when they trailed by 16. Belichick said the Patriots don’t win without that play. New England can’t let him walk. 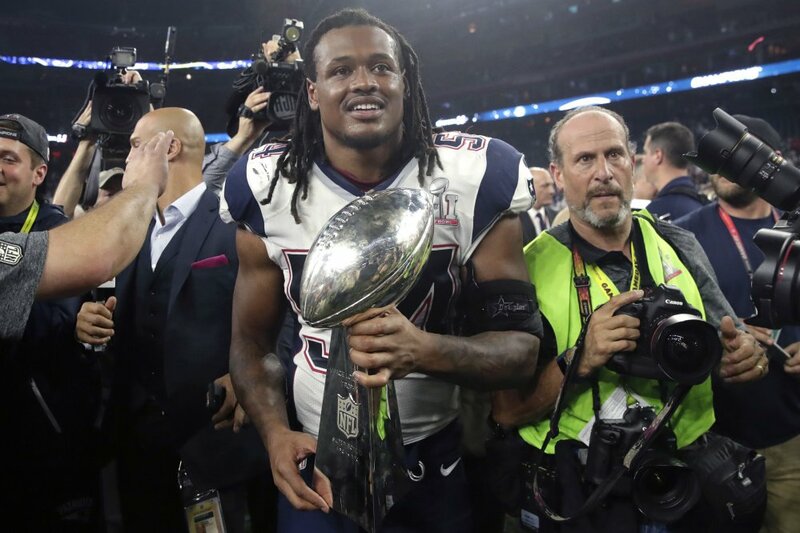 They could put the franchise tag on him, which would pay Hightower about $15 million next season. Or they could sign him long term and put the franchise tag on Bennett, giving them depth at tight end if Rob Gronkowski gets hurt again and saving a little money (the tight end franchise tag is about $10 million). Bennett proved invaluable as a blocker, receiver and locker-room presence. Branch is coming off the best of his 10 pro seasons and the Patriots would love him back at the right price. Super Bowl winners, however, tend to get inflated contracts. We’ll see. Ryan and Harmon will be paid by someone. Ryan has his critics, but he routinely lines up on the best receivers and does a great job. The Patriots should bring him back. Harmon is underrated but valuable in subpackages. He can track the ball and put on a hit. If one of the two leaves, you can be sure the Patriots will go hard to keep the other. And what about Blount? The Patriots love him. He gained nearly 1,200 yards rushing and scored a team-record 18 rushing touchdowns. He is 30 and it’s unlikely he’ll get a long-term deal from New England. Develin, unheralded but a vital contributor to this offense, is a good bet to return. His versatility is too valuable. Floyd is intriguing. He fit in well with New England, arriving late in the season after Arizona released him for off-field issues. If he stays, it’s likely one of the other receivers doesn’t come back. WHAT HAPPENS WITH MALCOLM BUTLER? Butler, the Super Bowl hero two years ago as a rookie, has become one of the NFL’s top four cornerbacks. He’s also a restricted free agent. What does that mean? The Patriots would be able to retain Butler, even if he signs with another team, by matching the offer sheet he signs within five days. And if they choose to not bring him back, it will cost the other team a high draft pick. The Patriots are likely to place a tender on Butler – either a first-, second-, or third-round tender. If he signs elsewhere and the Patriots don’t match the offer, New England will receive a compensatory draft pick from his new team in the round it tendered Butler. Butler is a tremendous talent. People only notice his pass coverage but he’s a great tackler as well. Hard to imagine the Patriots will let him walk. They need a shut-down corner like him to make their defense work. WILL JIMMY GAROPPOLO BE HERE NEXT SEASON? 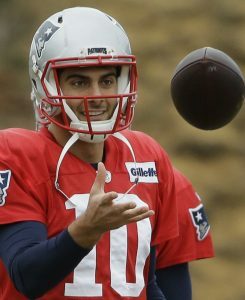 In a perfect world, Jimmy G. stays in New England to give the Patriots protection at quarterback in case Tom Brady gets hurt. He proved his worth last fall when he stepped in for the suspended Brady. He had a quarterback rating of 113.3 before he was injured, with four touchdown passes, and wins over Arizona and Miami (where he was Brady-like). There are enough teams out there that need a quarterback – Cleveland, Chicago, San Francisco among them. The Patriots probably could get a decent haul of draft picks for him in a trade. But are they comfortable enough with No. 3 quarterback Jacoby Brissett, who played well in the two games he started after Garoppolo got hurt, to let their backup go? You can bet those conversations have been happening for a couple of days now. And will continue for many more. No one does that better than the Patriots, with six consecutive appearances in the AFC championship game and two Super Bowl titles in three years, five overall in the last 16. The Patriots are set on the offensive line, which is young and getting better, so they likely won’t pursue any big names there. They need to get younger at running back and probably will focus on linebackers in either the draft or free agency. Defensive end could be a need as well if Sheard and Long leave. It’s not a great crop of free agents this year, but there are some intriguing names the Patriots might pursue if they lose their own. Such as running back Eddie Lacy of Green Bay. He’s a former Alabama back and Belichick loves those guys. And he’s only 26. Cordarrelle Patterson of Minnesota, a good return man and wide receiver, fits a need. Kansas City defensive tackle Dontari Poe might be a good fit. Or a veteran like Julius Peppers of Green Bay on the outside of the defensive line. The offseason has begun and you can be sure the Patriots are already working on it. After all, there are no days off for the new champs.